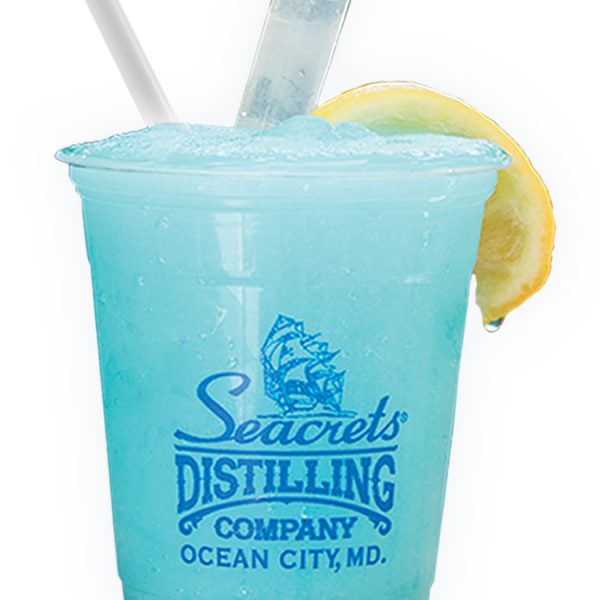 A frozen blend of Seacrets Lemondrop Vodka, Blue Curacao and sour mix. Delicious and refreshing! Hoop Tea Mango with Seacrets Coconut Rum and a splash or cranberry juice. Seacrets Lemon Drop Vodka, strawberry puree, and lemonade with a splash of Sprite. Seacrets American Whiskey & ginger ale with a splash of OJ, topped with Seacrets Tropicale. Seacrets Orange Vodka, Seacrets Lemon Drop Vodka, pineapple juice, cranberry juice & Red Bull. * 2017 "Name That Drink" Winner Mark V.
Multiple layers of frozen rum runner and pina colada. It’s the House Specialty! A frozen mixture of rum, cream of coconut and pineapple juice. A delicious blend of Seacrets Spiced Rum, guava and juices. Perfect. A fruity frozen mix of blackberry and banana liqueurs with a kick of gold rum. Seacrets Blood Orange Vodka, Triple Sec, orange juice & a splash of sprite. The perfect summer cocktail - Try it on the rocks or frozen with a float! A frozen blend of banana and coffee liqueurs, cream and ripe bananas. Seacrets Vodka and Ting, a lightly carbonated Jamaican grapefruit drink. A combination of Seacrets Blood Orange Vodka or Seacrets Spiced Rum with OJ and Red Bull. Seacrets Spiced Rum layered with fresh guava nectar topped with frozen pina colada and served over ice. Seacrets Vodka and Ting, a lightly carbonated Jamaican grapefruit drink, with a splash of cranberry juice. Seacrets Spiced Rum, Seacrets Coconut Rum and pineapple juice. A combination of Seacrets Coconut Rum, Seacrets Gold Rum and Seacrets Spiced Rum, with a Seacret blend of fruit juices. Seacrets Coconut Rum, banana liqueur and pineapple juice. Seacrets Spiced Rum, Seacrets Gold Rum, Seacrets Coconut Rum, pina colada, grenadine and pineapple juice. A refreshing blast of Parrot Bay Mango Rum with pineapple & cranberry juices. Seacrets Vodka mixed with our homemade Jamaican Bloody Mary Mix, celery & Old Bay rim, like Maryland does! Seacrets Coconut Rum, pineapple and cranberry juice. Seacrets White Rum and Coke with a lime. A wheat ale brewed with hibiscus flowers and clover honey, Seacrets Tropicale is a crisp and refreshing ale. Hibiscus flowers give a slightly pink hue to the refreshing but subtly complex ale. Cuervo Tequila, triple sec, lime, sours and a splash of orange juice.